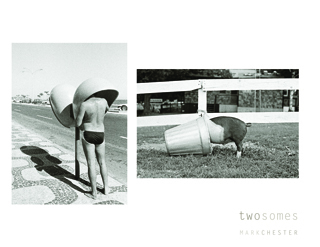 Twosomes is a compilation of “twosomes and then some.” Some time ago I realized when looking through my files of prints and contacts that my photographs are more than pictures of people, places, and things that touched me in some emotional, intellectual, or whimsical way. Many of them also contain two or more of a given subject – two women, two men, two gloves, etc. I developed the idea of presenting two images next to each other on the exhibition wall – and ultimately on the facing pages of a book. Juxtaposed here, then, are images from forty years of traveling with a camera. 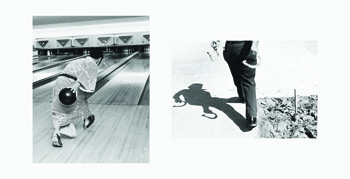 Published in 2011 by Un-Gyve Press the 218 page hardcover book Twosomes features 202 plates, 101 image pairs representing forty years of photography by Mark Chester. The 11" x 13" hardcover book with dustjacket retails for $75. ISBN: 9780982919804. Designed by Un-Gyve Limited. Introduction by Julia Courtney, Curator of Art for the Springfield Museums, Springfield, Massachusetts. "I've known Mark for more than thirty (40?) years. His maturity has grown with his wit. He has a marvelous sense of humor which he is able to use in capturing life's amusing moments. It makes you feel good when enjoying Mark's photographs." "Mark Chester’s Twosomes is a double treat. Individually, his photos are poignant, funny, and marvels of composition. In pairs — like the two elderly women on a park bench, dressed alike and legs crossed just so, matched with the 20-something identical twins in 1920s flapper garb — the photos play off and enhance each other. This is a wonderful collection. Enjoy, enjoy."